on the inside and outside. Place the grate in the Profi roasting pan. Cover the base of the roasting pan approx. if needed. Keep brushing the duck lightly with water every now and then. Put the apples on the grate. for another 30 minutes or so and brush it three times with the honey-duck sauce in the meantime. 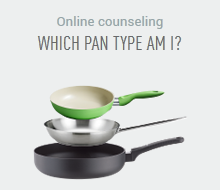 pan, remove the fat as much as possible and let the juice reduce a little over high heat. and pepper. Add the port wine sauce and roasted apples to the crispy duck. 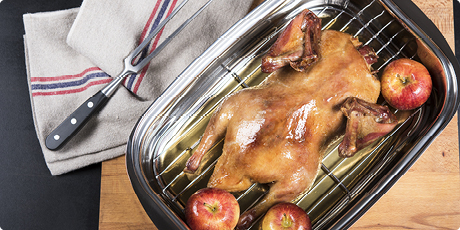 Quick side dish: steamed potatoes cooked with the Kelomat go very well with this crispy duck. 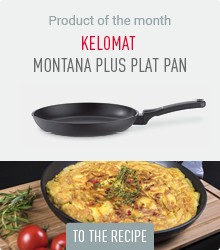 KELOMAT’s roasting pan Profi is a true all-rounder in first-class stainless steel. It opens new possibilities in the kitchen for you. It can be used for roasting and stewing poultry, venison, fish and large pieces of meat, for instance.